Flyers winger Jordan Weal will play a key role in the success of the team for the rest of the season. The Flyers' big guns have carried the offense this season, but secondary scoring will be needed in the final two-plus months if this team is going to land in the Stanley Cup playoffs. That means players like Jordan Weal (six goals), Michael Raffl (nine), Val Filppula (10), Nolan Patrick (three), and Scott Laughton (seven) will play key roles. "It's going to be huge," Weal said Tuesday after practice in Voorhees, where the Flyers prepared for Wednesday's game in Washington. "There are so many teams, especially in our division, that have two awesome lines. Just like us. If we can get the third- and fourth-line guys to kind of step up and get some goals here and there, it's going to make the difference. A lot of games, the top two lines are going to cancel each other out, and that's when the depth players have to come in and really make their mark and control the fate of the game. "I think we've been doing a really good job of that lately." Raffl, who will join the third line Wednesday and have Weal and Filppula as his new linemates, has nine goals in his last 28 games and three in his last 10 games. Weal has also chipped in lately, scoring three goals in his last 11 games. "I haven't played much with Raf, but he works his bag off every game," Weal said. "He's a great checker, great scorer, and can handle the puck down low. I think if we all continue to work hard and play our game, we'll be a pivotal line to our team." Weal will be trying to duplicate last season's strong finish — eight goals in the last 19 games. Sean Couturier (26 goals, 23 assists), Wayne Simmonds (16 goals, 13 assists), Claude Giroux (14 goals, 43 assists), and Jake Voracek (nine goals, 47 assists) have scored 65 of the team's 141 goals. If you include goals and assists, they have accounted for 189 points. Travis Konecny has also been a key contributor lately. He has 10 goals, including six since he was promoted to the top line 14 games ago. Coach Dave Hakstol said secondary scoring will be one of the Flyers' focuses when they play their final 33 games in 67 nights. "That's something we want to keep improving," he said. "… Everything is so tight coming down the stretch, so if you can get a little bit of scoring from throughout your lineup, I think that's not only critical but is necessary. That's something we hope we can keep growing." Veteran goalie Michal Neuvirth, who had been battling a stomach virus, returned to the Flyers' practice Tuesday and said he was ready to face his former team, the Capitals, on Wednesday. 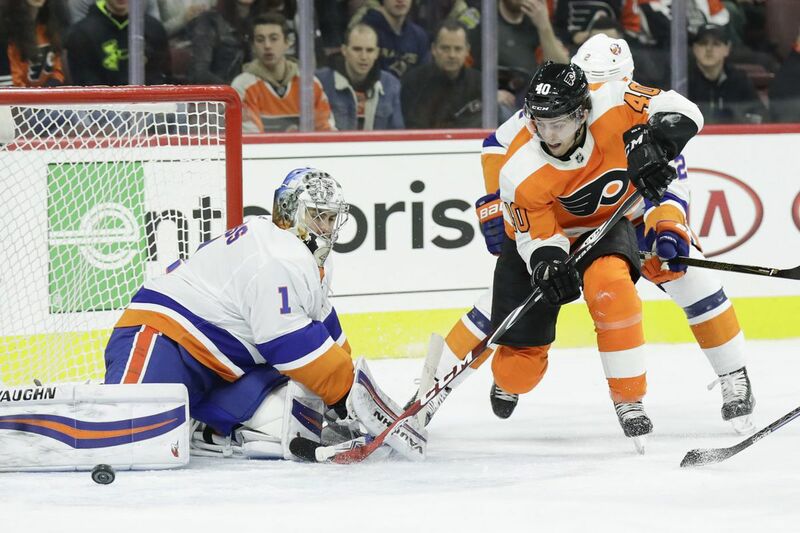 Brian Elliott was still sidelined with an undisclosed lower-body injury, and the Flyers recalled Alex Lyon from the Phantoms. Neuvirth will likely start Wednesday and get a chance to redeem himself after Thursday's 5-1 loss to Tampa Bay. "It's good to have Neuvy out there. He had a good practice and looked strong," Hakstol said. Hakstol hinted that Lyon, 25, would make his NHL debut Thursday in New Jersey, saying there was a "strong possibility that both guys will play one" of the next two games. "I know he's had his ups and downs in the American Hockey League, but certainly his play of late has been excellent down there," Hakstol said of Lyon. "Any time he's with us, he carries himself with a poise and a presence of readiness. You see that off the ice, and for sure today in practice, you see on the ice as well." Lyon was 13-8-2 with the Phantoms with a 2.90 goals-against average and a .910 save percentage this season.